Listening to Berserk, it’s no surprise that Eminem’s forthcoming album will be called ‘The Marshall Mathers LP 2’ – a sequel to his multi-million selling ‘The Marshall Mathers LP’ from 2000. As he raps in the opening lyric, “let’s take it back to straight hip hop and start it from scratch” – Berserk eschews the more mature, serious tone of his recent material for something that looks back to the earlier days of hip-hop, whilst retaining a sense of playfulness. As the title suggests, the production is crazy. Records are scratched, guitars blaze, and a simple beat socks you right in the gut, over which Eminem spits his rhymes inviting us to let ourselves go (amongst cultural and tongue-in-cheek references). And that's exactly what he does himself. In contrast to the exploration of abuse in Love The Way You Lie, Berzerk seems frivolous but it's the sound of Eminem having fun in the studio with his old collaborators Dr. Dre and Rick Rubin. Berzerk might seem like a step backwards in comparison to newer artists like Kendrick Lamar (who, incidentally, is name checked here), but nobody does it quite like the Real Slim Shady. Even if the album sequel doesn't live up to the 2000 classic, it sure is good to have Marshall Mathers back. 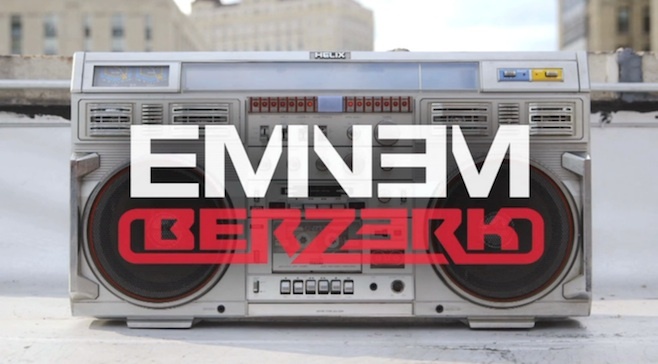 Listen: Berzerk is available now.